Five for Friday and a Birthday Giveaway!! Ahhhhh!! It's finally Friday and it has been a really long week!! 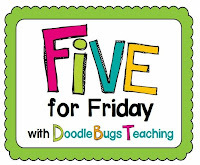 I am linking up with Doodle Bugs Teaching for the first time for the FABULOUS FIVE FOR FRIDAY linky!! What could be better than random stuff from everyone's week?! It gives me a chance to give a shout out to some of my favorite bloggers and TpT Sellers!! 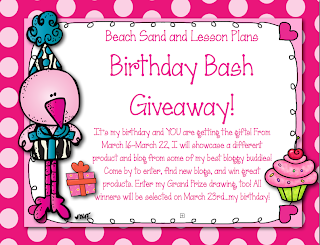 First, I want to send a HAPPY BIRTHDAY shout out to my bloggy buddy Gina, from Beach Sand and Lesson Plans who has a birthday giveaway beginning Saturday, March 16 (tomorrow)!! You will be able to enter a different rafflecopter every day next week, with the winners selected on Saturday, March 23rd!! I love me a good rafflecopter giveaway, don't you?!! If you teach first grade, or even second, you have to check this out!! I taught first grade for a lot of years and I wish I would have had this pack to help me to teach nonfiction writing!! Ugh....it can be daunting....but not with Wazy's product...easy peasy and super fun!! Third, I want to highlight one of my favorite and most recent purchases from TpT. I have to admit that I spend nearly as much as I make on TpT...I am a bit of an addict when it comes to quick and easy teaching materials. I mean, if it can make your life easier....I'm all for it. 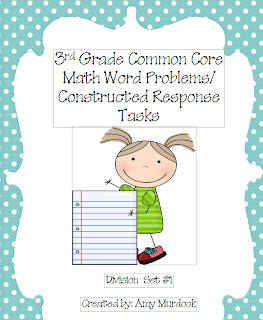 Speaking of which...I am a bit obsessed with the Common Core lately and I found these great Constructed Response Task for Multiplication by Amy Murdock. She has another set just for division and packs specifically for assessment. I have been using these with my class every day as supplemental work and it has really helped a lot!! The best part is that they are a great value at only $2.00 each!!! We have been doing book clubs in my class and it has been so awesome!! The kids have completed two rounds of Mystery Book clubs and their level of thinking and discussion has really improved. Mostly, they had a lot of fun and it has amped up their reading enjoyment level...which is a really great thing...don't you think? We used this discussion prompt bookmark to get us started...it is part of my Ultimate Book Club Guide....but I want to give it to you for free to nudge you into doing book clubs with your kiddos (you probably already do!). Click HERE to download the freebie!! Finally, I wanted to celebrate my 102 followers!! Thank you for supporting me!! Yay to 102 followers! Congratulations! If you are having a giveaway, I am more than happy to donate, just email me at aahislop963@gmail.com! Congrats on reaching over 100 followers!!! I am with Alison if you need anything for a giveaway I'm in. I am going to head over right now and check out some of those fav. bloggy buds. Me too me too! :) I will be happy to donate! Will I make it 4? Congratulations! We just started doing book clubs. I'm going to check out your guide! Wow!! I was planning to tiptoe into my 100 follower landmark....but I think I will plan a giveaway!! You guys are so generous to offer!! Thank you!! Congratulations, let me know if you want something for your giveaway, I would love to help out. I am your newest follower. Congrats and what great products! I am your newest follower -- at 107! Awww...I have been MIA in blogland lately, so seeing this just made my day. Thanks!!!!!!! Could you imagine life without blogging and TpT? What a blessing! Have a great weekend...are those cards done yet!? Writing Informational Text -- Step by Step!! Earth Day Freebie and Reader's Theater ON SALE! The Ultimate Math Data Toolkit -- and a FLASH FREEBIE! Help for Struggling Writers and a Giveaway! Enjoy some Sunday afternoon shopping!! © 2015 Third Grade Doodles. Blog Design by Design by Christi. Built on Phoebe Template designed by Georgia Lou Studios All rights reserved.